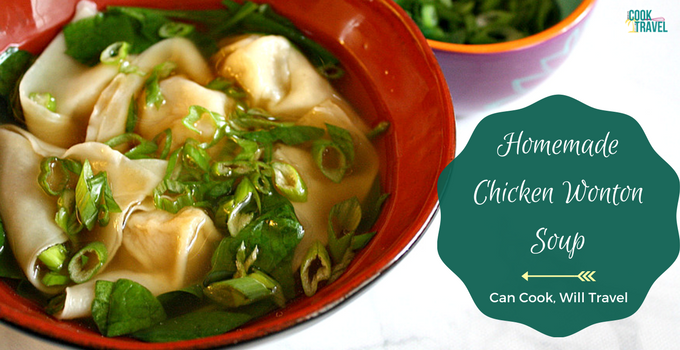 I love how this Homemade Chicken Wonton Soup is perfect comfort food, so here’s what you’ll need. 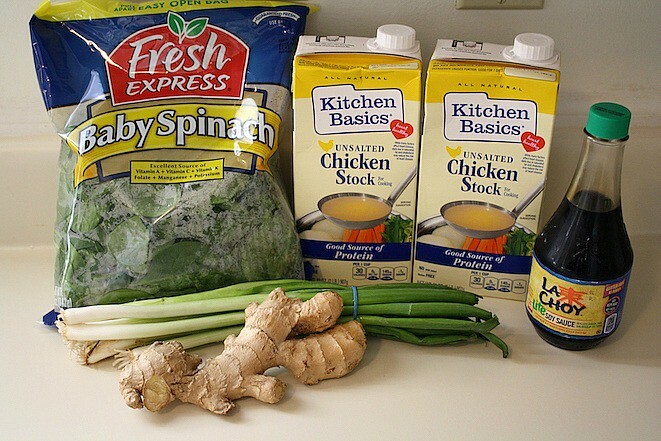 First off you can use store-bought stock, make your own, or jazz up store-bought stock, which is what we’re doing here, so grab the following: Baby Spinach, 8 cups of your favorite broth or stock (I prefer this unsalted chicken stock from Kitchen Basics because it’s dairy free), Soy Sauce (reduced sodium), a bunch of Scallions, and fresh Ginger. Then to make the chicken wonton filling for the Homemade Chicken Wonton Soup, you’ll need the following: Toasted Sesame Oil, square Wonton Wraps (12 ounce package should give you around 20 wraps), Cornstarch, Soy Sauce (Reduced-Sodium), Kosher Salt, Scallions (enough for about 3 tablespoons or you can use fresh Chives), Fresh Ginger, ground White Pepper, and 3/4 to 1 pound of Ground Chicken. 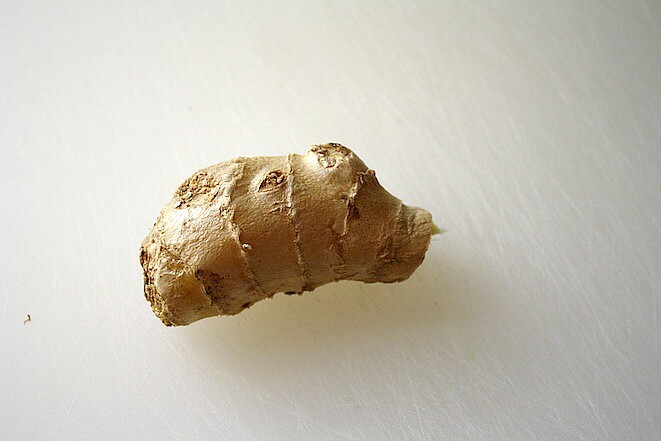 Now I always have ginger on hand, so you’ll need to first get about a 3-inch piece of fresh ginger. Then the easiest way to peel it is to use a spoon to scrape off the peel. Once your ginger is peeled, roughly slice it up and set it aside. 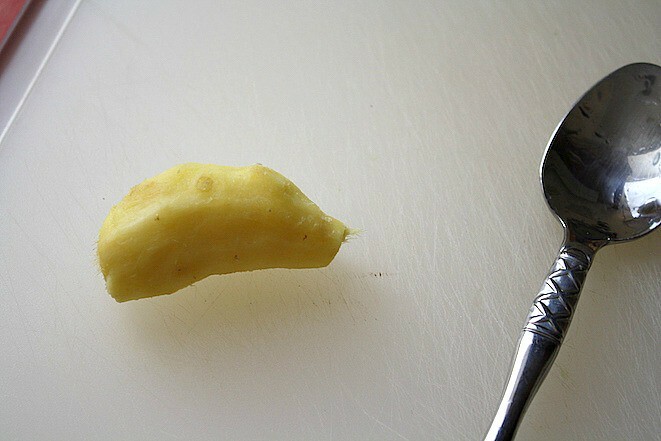 Then take about a 1-inch piece of fresh ginger and peel it with a spoon. 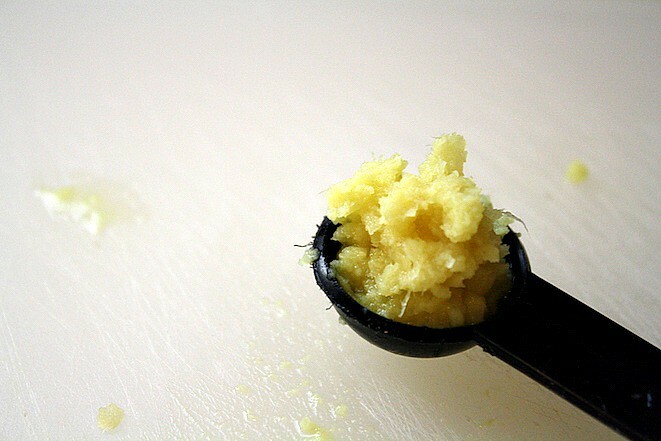 Grab a microplane grater, and then grate the ginger until you have about a teaspoon and a half. Here you can see the ginger has been grated, and since this part is a bit tedious I called this super heaping teaspoon good enough – haha! 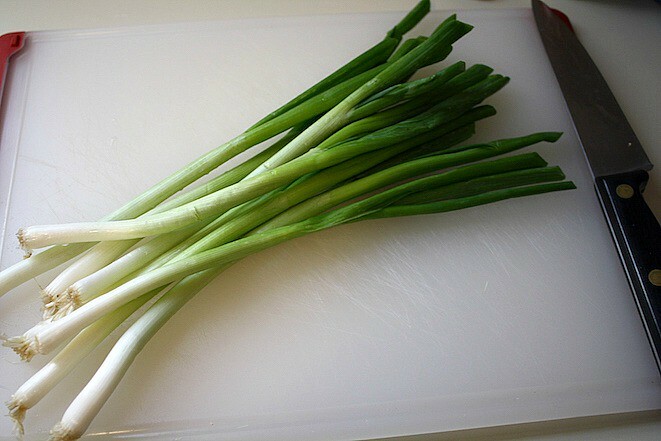 You’ll want an entire bunch of scallions, so first clean off any outer leaves that don’t look good. And then wash them really well and pat them dry. Then thinly slice the dark green sections and reserve those in one bowl, and roughly chop the light green and white parts in about 1-inch pieces. Go ahead and reserve 3 tablespoons of the dark green pieces for the filling, then set aside the remaining dark green slices and keep the light green and white segments separate. You can either weigh out 3/4 pound of chicken or just use a whole pound, and I think next time I’ll just use it all, because I ran out of filling. 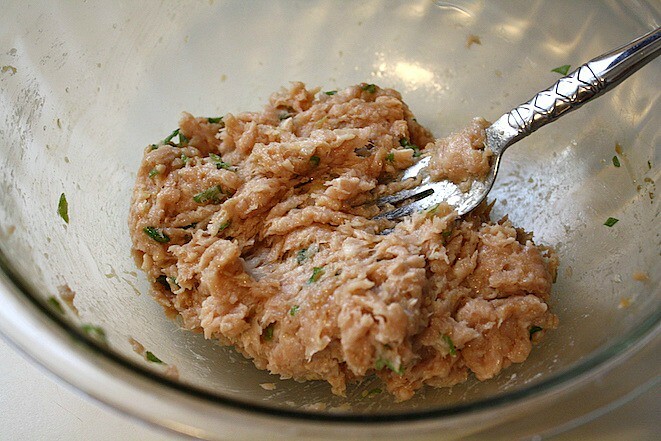 Now it’s time to add your filling ingredients t the chicken so add in 1 teaspoon of soy sauce, 3/4 teaspoon of salt, 1 1/2 teaspoons of toasted sesame oil, the grated ginger, the 3 tablespoons of reserved sliced scallions, and a nice sprinkle of white pepper. 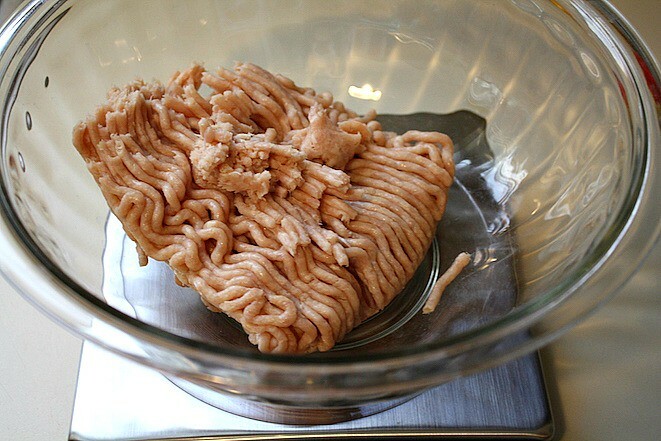 Use a fork and combine the filling so that everything is evenly mixed throughout. 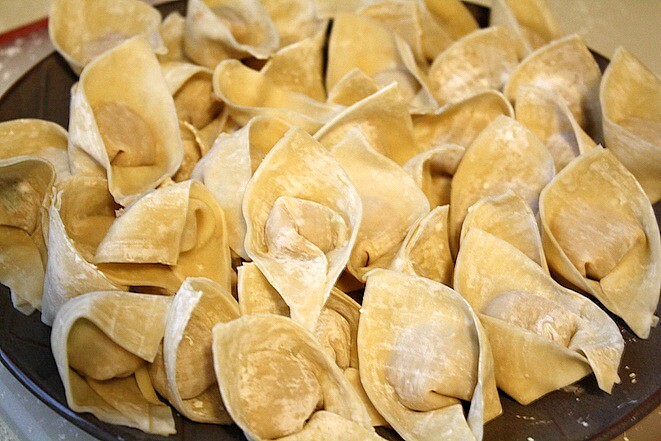 Now it’s time to make your wontons for your Homemade Chicken Wonton Soup, so place a layer of wraps on your work surface, and I did 6 at a time. Then add about a teaspoon of filling to the center of each wrap. Put some water in a small bowl and then use your finger to spread the water around the edges of the wraps as you see here. Then pull one corner to the other and press together. I found it easiest to press around the filling to remove any air, and then press out to the sides that you form a cute triangle. Now you’ll be pressing the 2 corners of the triangle together, so add a little water to 1 corner to help them stick. You’ll hold up the triangle and fold it downwards slightly to bring the 2 ends tighter under the filling and press so they stay together. Repeat with remaining wonton wrappers and filling. Place the wontons on a plate that you’ve sprinkled with cornstarch, because that will help them not stick to the plate or each other. As you form the wontons, you can jazz up your homemade stock for your Homemade Chicken Wonton Soup, because you might as well multitask. Add 8 cups to a large pot and heat it to about medium heat. I made half the stock, because I was leaving town and wanted to freeze my wontons for future recipes. 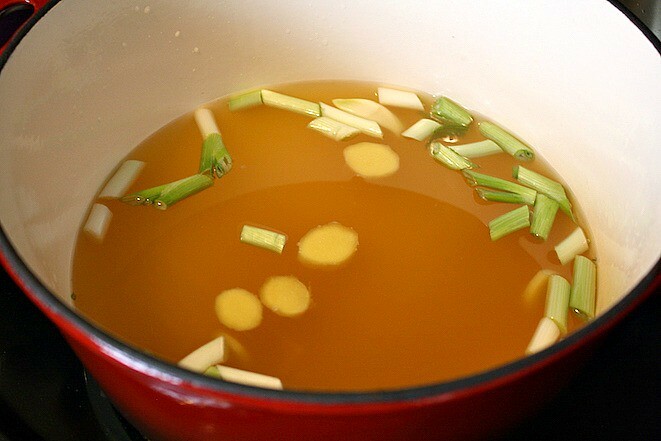 Then add the sliced ginger and segments of scallions plus the 2 cloves of smashed garlic to the stock. 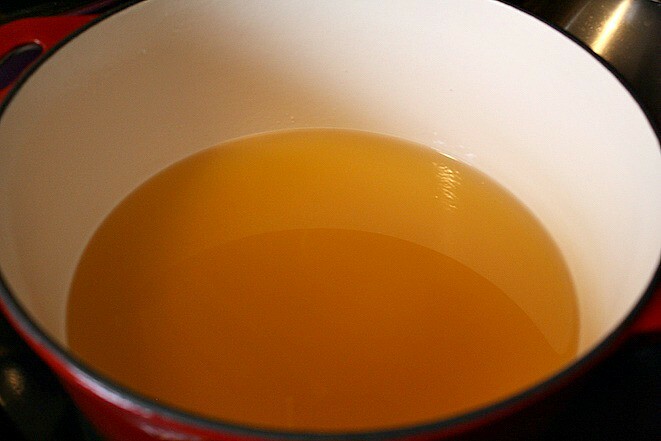 Let them simmer in the stock for at least 20 minutes, so then the flavors infuse in the stock. 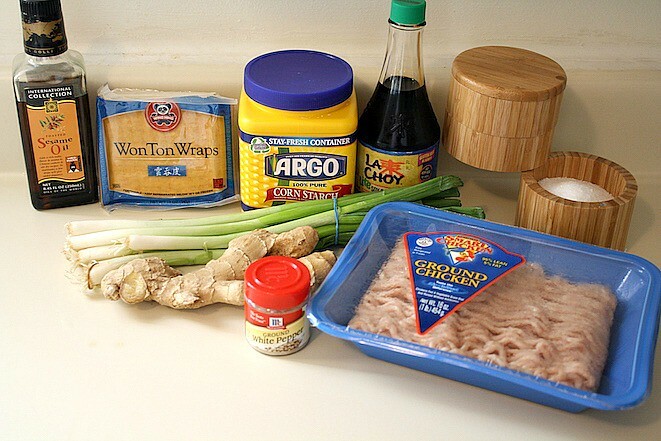 You can also add soy sauce or salt to the stock, so I added a splash of soy sauce. Finally the stock has simmered, so remove the veggies, and I used my handy dandy spider for that. When you’re ready to serve the Homemade Chicken Wonton Soup, bring a small pot of water to a boil, because this is where you’ll cook the wontons. Then add the wontons (I did 6 at a time) to the pan and cook for 3 minutes. You can cook these in the stock, but since they have cornstarch on them, it’ll muddy up your stock, so I kept them separate. 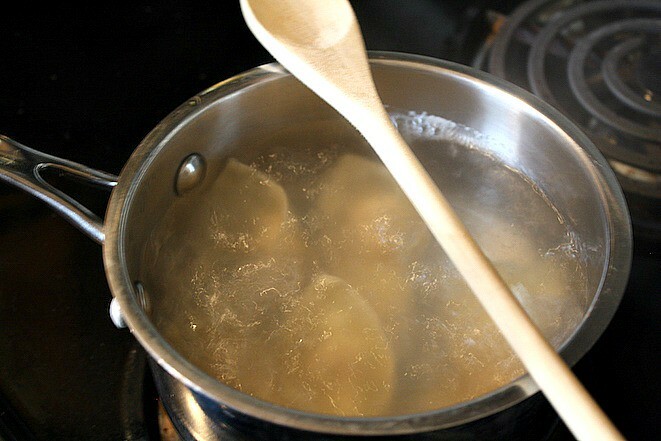 A trick is to place a wooden spoon on top, because it keeps the pasta water from boiling over. 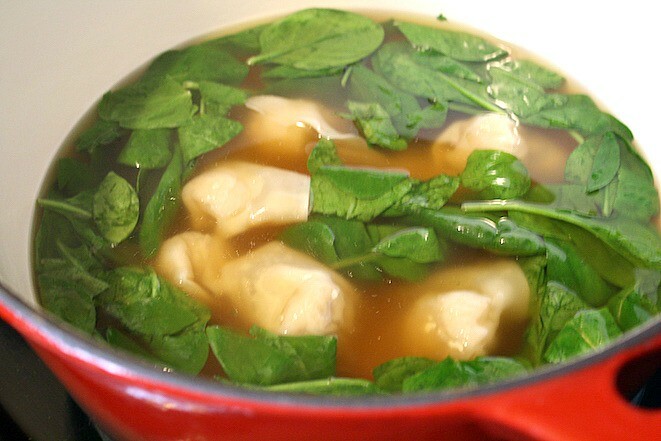 When you’re ready to serve your Homemade Chicken Wonton Soup, add the baby spinach and then cook for a minute. Finally add the cooked wontons to the soup and heat for about 30 seconds. Serve the Homemade Chicken Wonton Soup right away and then garnish with the sliced scallions you reserved along with a drizzle of sesame oil and soy sauce. Happy wonton making!! This recipe is not only fun because you make your own chicken wontons, but you can freeze them and make this recipe anytime you are feeling under the weather. Yum! To begin the wonton filling, prep all of your veggies by grating your ginger, mincing your chive or scallions. 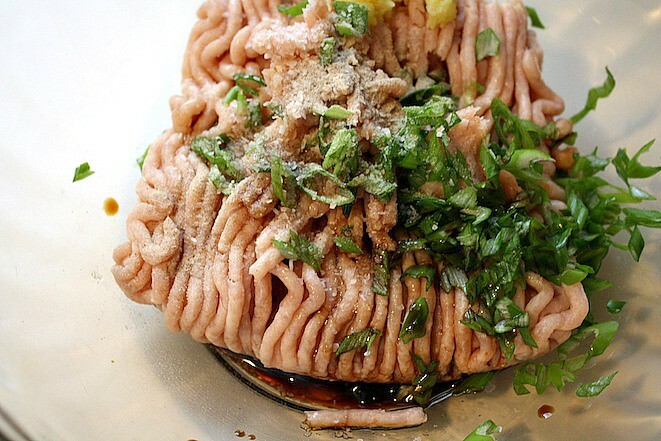 Then combine the ground chicken with the soy sauce, salt, toasted sesame oil, grated ginger, chives or scallions, and white pepper. 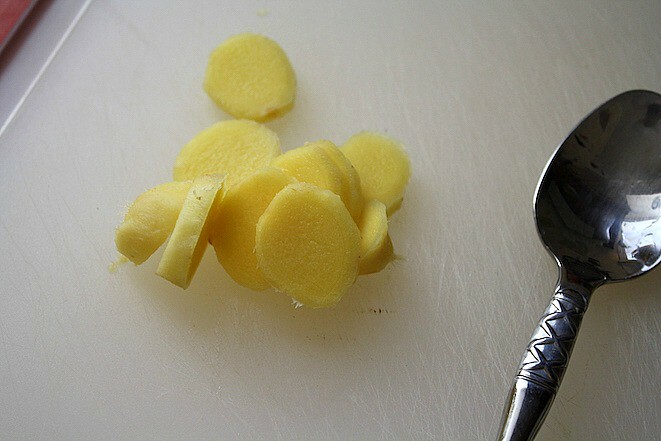 Next we’ll make the homemade stock, so prepare your veggies by peeling and slicing your ginger. 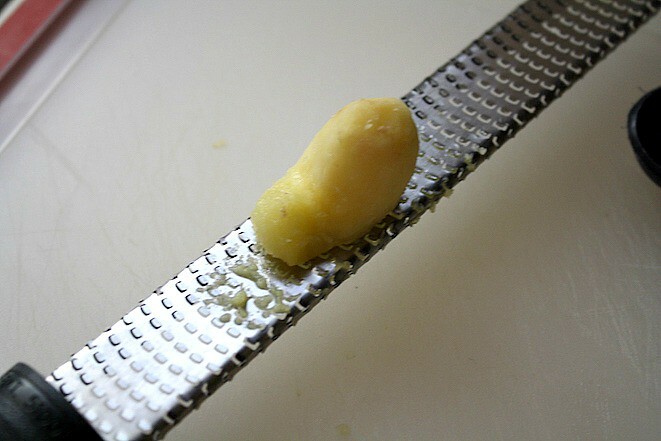 Remove the skin from 2 garlic cloves and give them a press on the cloves to crush them a bit. 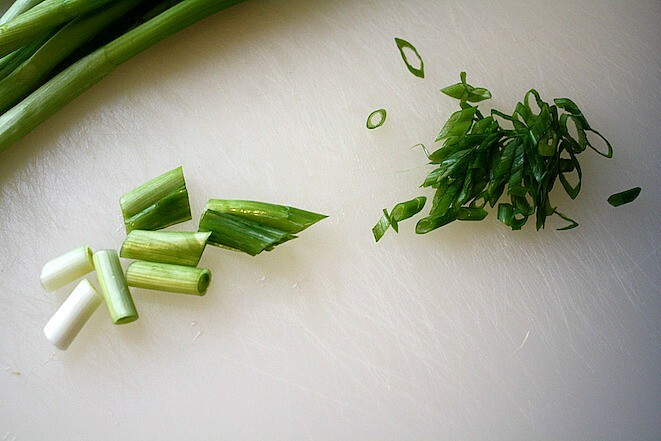 Finally wash your scallions and remove the outer leaves if necessary, and then thinly slice the darker green parts of the scallions for finishing the soup and then chop the light green and white sections into 1/2” to 1” pieces to flavor the stock. Now as you make your wontons, you can go ahead and simmer your stock. 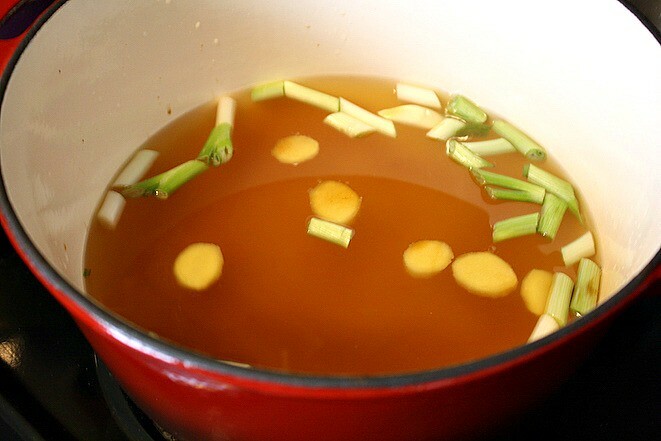 In a large saucepan, add in the broth along with the sliced ginger, crushed garlic, and the light green and white pieces of scallions and heat over medium heat. 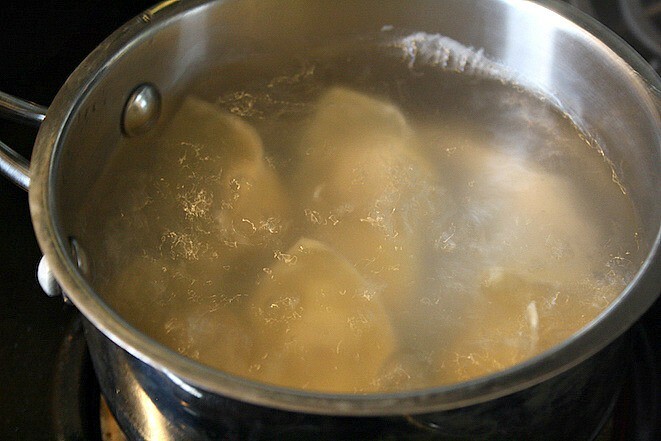 Then allow to simmer while you form your wontons. 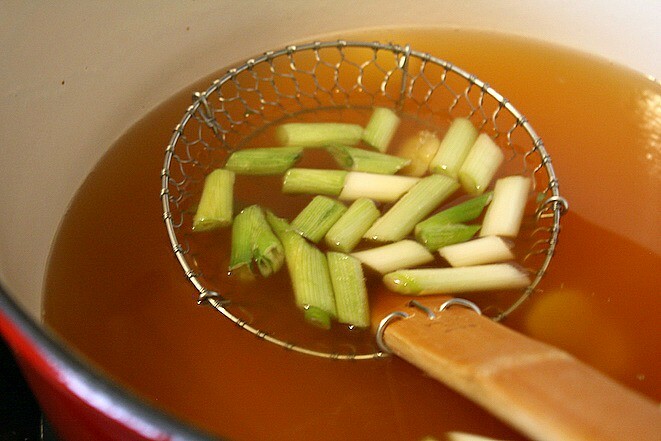 After at least 20 minutes, you can strain out your ginger, garlic, and scallions and the stock is done. 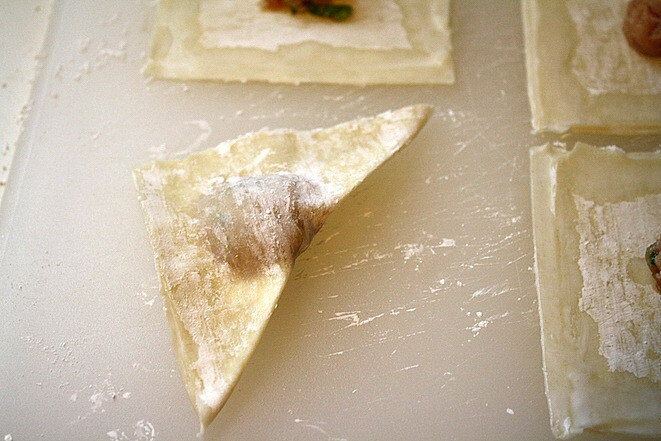 To form the wontons, lay out some wonton wrappers on a cutting board and put about a teaspoon of filling in the center of each wonton wrapper. 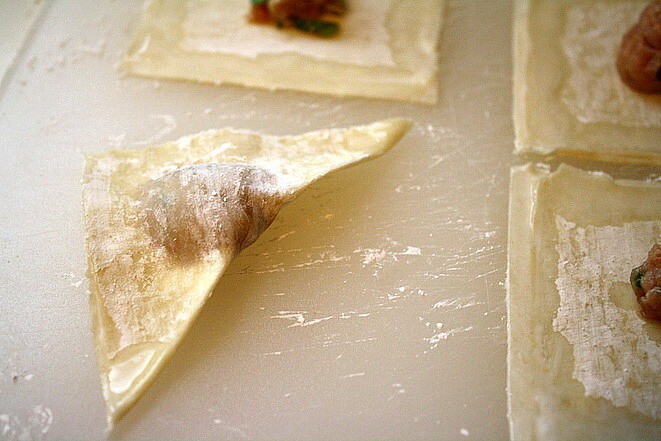 Then fill a small bowl with water and use your finger to spread the water along the edges of the wonton wrapper. Fold one edge to another and press around the filling to remove air bubbles and press along the sides to form a triangle. Finally add a little water to the tip of the edges that are at the bottom of the triangle and fold your edges down and press together so that they meet under (not over) the filling. 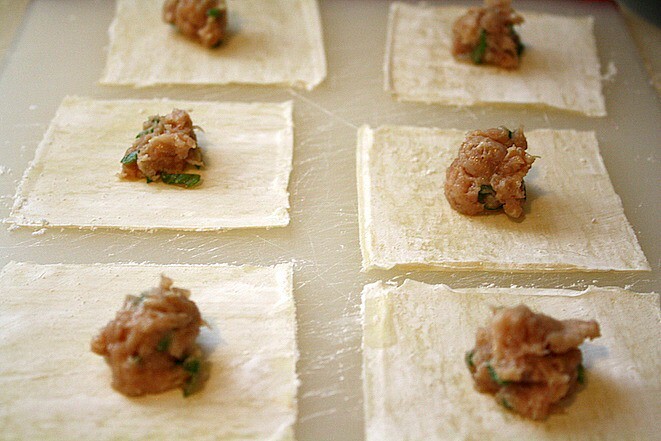 Repeat until all of the filling or wonton wrappers are used up (whichever occurs first). 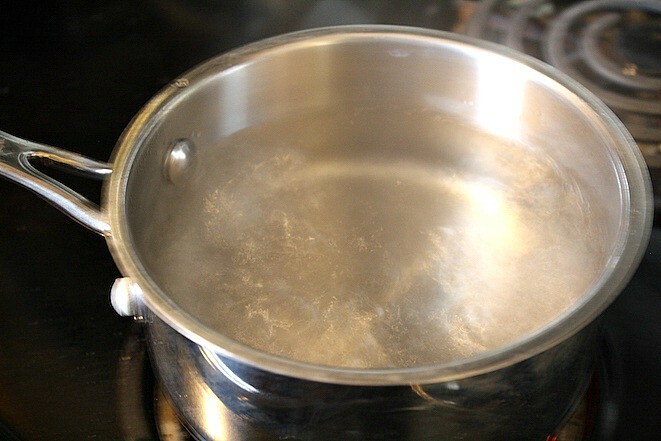 When you’re ready to make the soup, bring a small saucepan with water to a boil. Then cook the wontons for about 3 minutes. 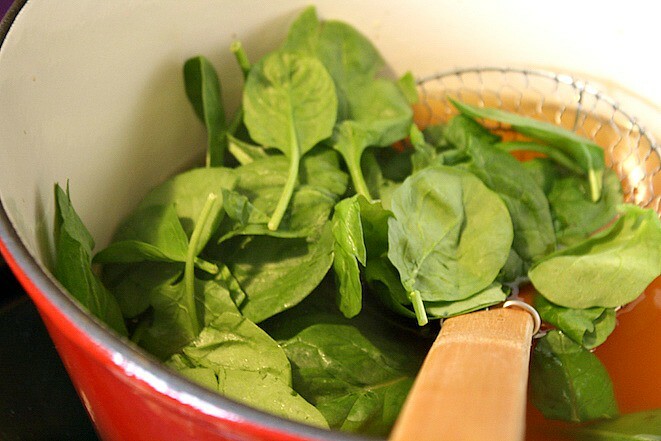 Right before you’re ready to serve, stir in the spinach leaves to the broth for about a minute. 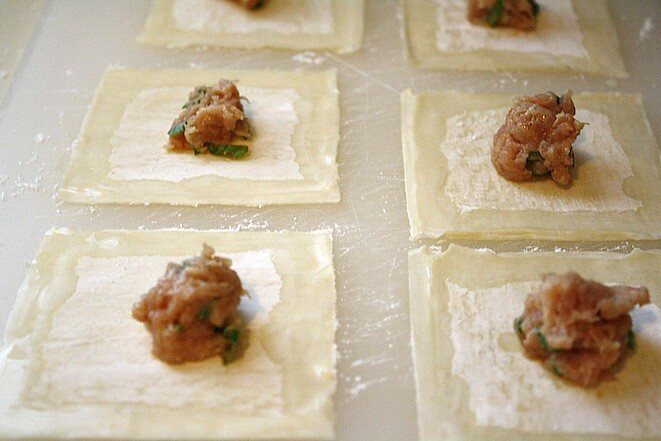 Then add in the cooked wontons for about 30 seconds or until they’ve heated through. 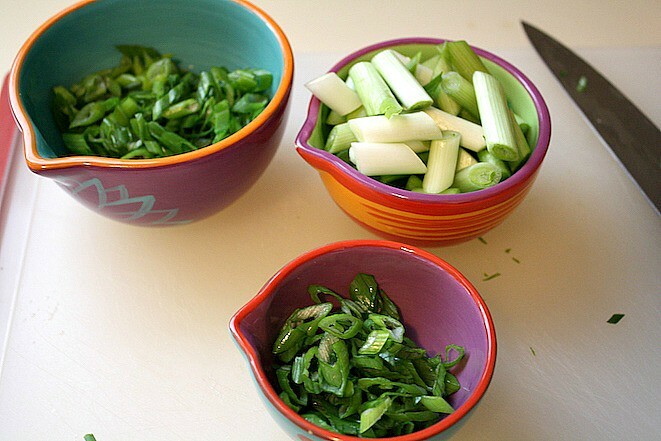 To serve the soup, add in about 2 tablespoons of the sliced scallions to each bowl along with a drizzle of toasted sesame oil and soy sauce for added flavor. And enjoy! 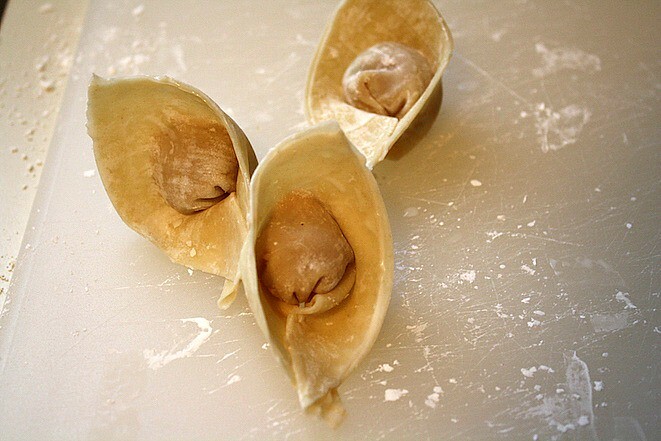 Quick Tip: To form the wontons, you can either make them in advance and refrigerate or freeze them, or make them the same day.